When I was a teenager me and my friends always got together to discuss important life topics while eating overly salted and kinda dirty sunflower seeds. Back in the day there was no way to find shelled sunflower seeds, so we had to work real hard for that precious kernel. It took true mastery to eat a small bag of sunflower seeds. The best part was that my fingers and my face were covered in something quite disgusting and black afterwards. I’d assume it was just a little dirt and nothing carcinogenic. I also like to think those black shades on my face made me look like Cinderella before her makeover and not like a homeless zombie. 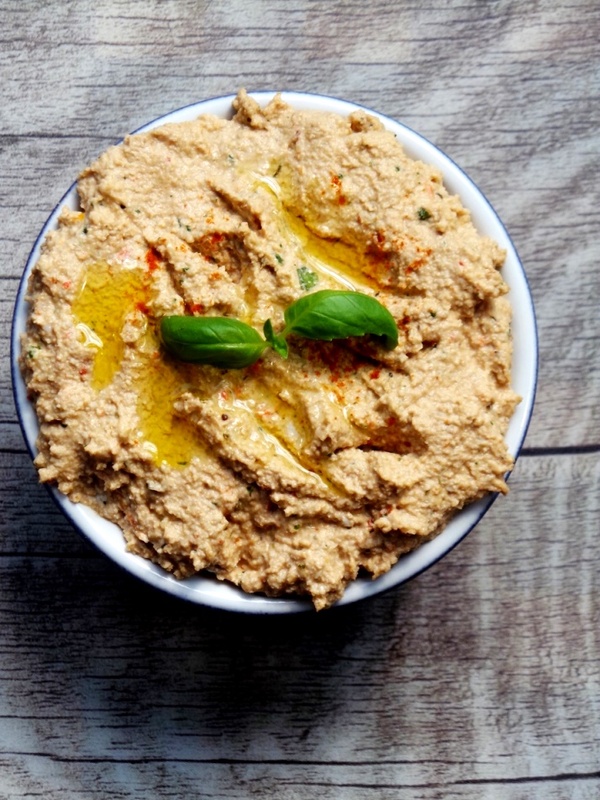 Well back in the day making this spicy sunflower seed cream cheese would’ve been impossible. For a number of reasons. First of all: I can’t shell a single sunflower seed without eating it. Second: even if I somehow do, I don’t have the patience to shell a whole cup of sunflower seeds. Third: I would have never thought of making cream cheese out of sunflower seeds and lastly even if I had the idea to make this cream cheese, the patience and the self-discipline to shell a whole bag of sunflower seeds without eating them, I wouldn’t have a food processor or a hand blender to make that cream cheese. See sometimes technology can be good. Because this sunflower cream cheese is one of the best things I’ve eaten. 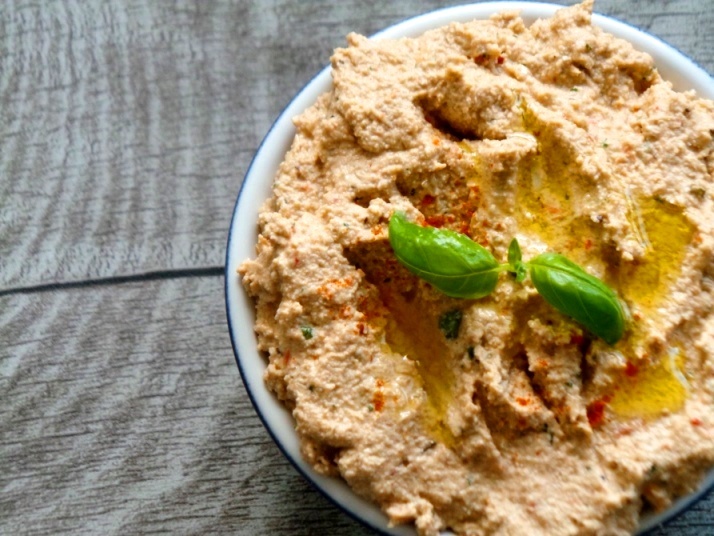 It’s spicy, creamy, super fragrant and amazing in wraps/pitas, with falafels, veggie burgers or as a toast spread. I would not have it for breakfast, as it’s very spicy and smells like garlic (I am a monster, I know), but it’s great for lunch or dinner. It will just take every meal to the next level and it gets better with time. Like most natural vegan spreads/dips it might turn a little darker with time. All you need to do in this case is to mix it a little and it will be awesome again. Here it is in pita action. This vegan cream cheese is heart-healthy, anti-cancer, detoxifying, could prevent bone loss and muscle cramps. It’s rich in Selenium, vitamin C, E & B1, folate and magnesium. As for beauty benefits: this vegan cream cheese delivers a ton of antioxidants and helps maintain the barrier function of the skin to prevent wrinkles and skin aging. 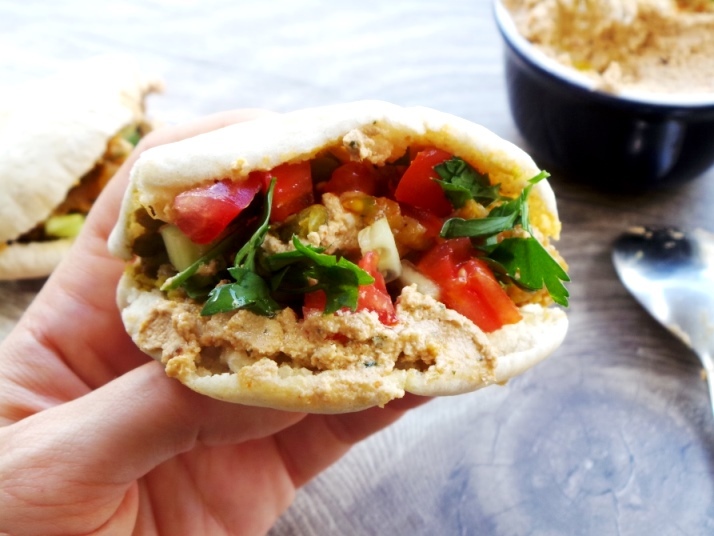 A spicy vegan, gluten-free and paleo cream cheese that is great for wraps, with falafel or as a dip. Soak sunflower seeds overnight, then rinse and drain. If you have a good food processor you might use it for the next step, if not use a hand blender - you'll need to make those sunflower seeds really creamy. Combine soaked sunflower seeds, water, roasted red pepper and lemon juice and process with the hand blender or your food processor until very smooth. Add all the rest of the ingredients and process again until smooth. Add salt to taste and transfer into a little jar. Use as a dip or in wraps/on a toast. Tomorrow I’ll share a recipe for the mini pitas I made with this vegan cream cheese. Hope you try this cream cheese, because it’s mind-blowing. Let me know if you do and if you have any suggestions how to make it even better! Are you using fresh of dried Rosemary?